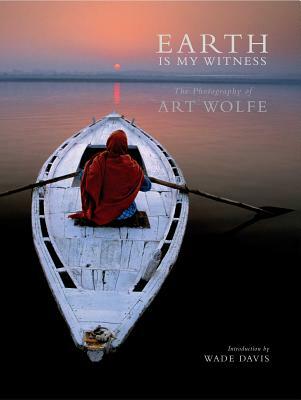 Art Wolfe’s definitive opus, Earth Is My Witness represents forty years of expeditionary photography. For the first time, Wolfe presents the three subjects at the heart of his work—landscapes, wildlife, and cultures on the edge of extinction—in a single masterpiece that takes us through the world’s ecosystems and geographical regions in a vivid display of the fragility and interconnectivity of life on Earth, while simultaneously exploring his evolution as an artist and the techniques he uses to capture the nuances and rhythms of nature. Earth Is My Witness is the most extensive collection of Art Wolfe photography ever compiled. This lavishly produced work spans the globe, bringing the beauty of the planet’s fast-disappearing landscapes, wildlife, and cultures into stunning focus. Containing unpublished work from throughout Wolfe’s widely celebrated career, Earth Is My Witness offers a riveting and comprehensive look at the world’s ecosystems and geographical regions. Here Wolfe presents an encyclopedic selection of his photography along with intimate stories that exemplify his boundless curiosity. From the rich sights and smells of the Pushkar Camel Fair to the exact moment when a polar bear and her cubs leave their Arctic den, these images represent what Wolfe has lived for: moments when circumstance, light, and subject miraculously collide to form an iconic image. These photographs and the stories behind them explore the delicate interconnectivity of life across our planet. Over the course of his forty-year career, award-winning photographer Art Wolfe has worked on every continent and in hundreds of locations. His stunning images interpret and record the world’s fast-disappearing natural treasures and are a lasting inspiration to those who seek to preserve them all. Wolfe’s photographs are recognized throughout the world for their mastery of color, composition, and perspective, and his photographic mission is multifaceted—art, wildlife advocacy, and journalism all inform his work. He lives in Seattle. Wade Davis studied for several years with Richard Evans Schultes while getting his PhD in ethnobotany and is a critically acclaimed, internationally best-selling author and anthropologist. His many books include The Serpent and the Rainbow, One River, The Wayfinders, and Into the Silence, winner of the 2012 Samuel Johnson Prize, the top award for literary nonfiction in the English language. Between 1999 and 2013, he served as explorer-in-residence at the National Geographic Society and is currently Professor of Anthropology and the BC Leadership Chair in Cultures and Ecosystems at Risk at the University of British Columbia.